1、USB 3.0 External CD/DVD Drive Burner with the durable aluminium alloy pressure - resistant wear - resistant materials. 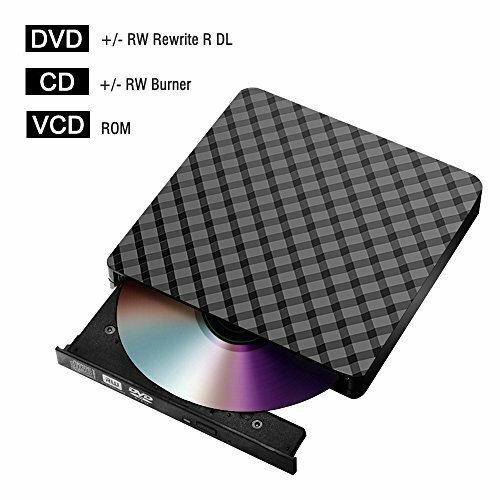 2、This optical usb dvd drive external can read CD-RW and DVD-RM,also it can burn CD-RW and DVD-RW. 3、Black external slim CD/DVD Drive. 4、No external driver and power needed.Support plug and play. 5、It features strong error-correcting ability,anti-shock and noise reduction technology. DVD-9,DVD-10, DVD-18，DVD+R/-R,DVD+R standard format disc. for Acer for Sony, for HP etc. 8、It's a good partner for your life, working, playing, teaching, parenting. 1. Before using the CD/ DVD-ROM drive, use a media player to open it. ase connect the drive to the USB interface on the computer main board . program or can't read the CD/DVD. 【High Speed】Equipped with USB 3.0 high speed interface, Dainty External cd/dvd drive burner can bring you faster data transmission speed up to a maximum of 5Gbps.The speed of DVD read/burn reached 8X,the speed of CD burn reached 24X. 【Easy to Use】No need to install driver,no external power needed,Plug and Play,Work with Both Laptop and Desktop. 【Portable】Thin, Light-weight,Easy to carry.Independent USB 3.0 interface can be foldable after use. 【Stable & Durable】EDA voltage stabilization system, intelligent control of voltage and current, avoid excessive voltage cause CD/DVD drive cannot be use or damage the device. 【Unique design】Silent reading disc.Increase vibration-proof function, effectively reduce noise.Anti-skid pad design to prevent the product from slipping down and damage.